We are a trustworthy manufacturer, exporter and supplier of a superior quality Double Wall Steel Utility Tank. 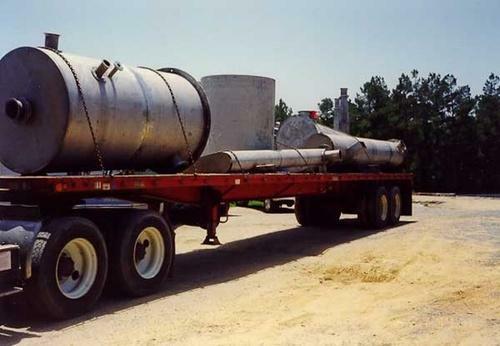 Our offered tank is manufactured by our experienced professionals using quality tested steel and latest technology in compliance with set international quality standards. To ensure its flawlessness, this tank is rigorously tested by the quality experts against several parameters. Moreover, clients can avail this tank from us at nominal prices. Incepted in the year 2005, in Ahmedabad (Gujarat, India), we “Basix Engineering” are known as the reputed manufacturer, exporter and supplier of premium quality range of Asphalt Plant, Concrete Batching Plant, Stainless Steel Tank, Mild Steel Tank, Brewery Equipment, etc. For the manufacturing of the offered products, we have established an ultra-modern infrastructural unit. We have furnished with modern tools and machines in our infrastructural unit that helps unit to meet all the demands of our valuable clients in the most successful manner. Divided into several departments, these processes are carefully supervised under the strict direction of our team of experts. Due to our fair business practices, client-oriented approach, competitive pricing structure and timely delivery, we are constantly increasing a long list of client satisfaction. We are also offering Maintenance Service to our customers. We are exporting our products Indian Subcontinent.